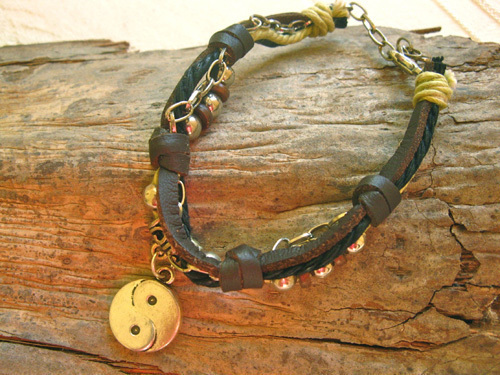 This earthy leather-and-cord bracelet ~ mocha is one of our NaturalSoul range and features a row of wooden and metal beads and a yin yang charm. This would make the perfect present to give a friend or loved-one, since the yin yang symbol represents the concept of harmony - two aspects in a single reality. A gift with meaning, and a gift with soul. Inspire your friend with this attractive charm bracelet, a constant reminder of a special friendship or relationship. Comes gift-wrapped (with an information card) like all our presents - and we can print a personal message on your behalf. More information about Yin Yang symbol . .